Yorick has always been a practical man. He knew he’d need strength to destroy the Black Mist that corrupted the Blessed Isles, even if it meant fighting evil with evil. So he harnessed a whole world of evil in the cape that now clings to his shoulders; in the unknowable depths of the cloak swirls the essence of a thousand damned souls. When the Shepherd summons forth a being from that seething miasma of lost spirits, only he hears the wretched assembly’s great wailing and gnashing of teeth—this is his burden, and the source of his power. In his quest to free these souls, he’ll use them (and they’ll use him) to crush anything in their way. Yorick can have up to four Mist Walkers in his service at once. Mist Walkers decay if they move too far from either Yorick or the Maiden of the Mist. A grave is occasionally created when enemy minions or neutral monsters die near Yorick, and all enemy champions that die near him leave a grave. Yorick’s next basic attack deals bonus damage and restores some health. If Last Rites kills a target, it creates a grave. If there are at least three graves nearby and Last Rites is on cooldown, Yorick can instead cast Awakening to raise Mist Walkers from the graves. Yorick summons a destructible wall of corpses that encircles a target area for a few seconds. Yorick hurls a globule of Mist that deals magic damage, applies a slow, and marks a target. Yorick and Mist Walkers get a movement bonus when heading toward marked targets. Yorick summons the Maiden of the Mist (at higher ranks, she’ll bring some Mist Walkers with her). The Maiden moves and attacks on her own. When Yorick attacks the Maiden’s target, he’ll deal bonus magic damage based on the enemy’s maximum health. Yorick has lived longer than most men, and he’s built up a hell of a lot of patience over the years. The Shepherd of Lost Souls is never happier than when he’s able to quietly farm in lane, shovelling out a whole necropolis of graves as he prepares to lay siege to any structures or unlucky souls in his path. Mist Walkers are great for sieges, but they’re just not that smart. Once yanked from the relative safety of the spirit-goop cape on Yorick’s back, they mostly want to hurl themselves (screaming and clawing all the way) straight down lanes. They’re fragile, so Yorick has a short window to enter a skirmish at full strength after he’s summoned a pile of Walkers. With his ghoulish army in tow, The Shepherd can encircle his lane opponent with a Dark Procession, then splatter them with some Mourning Mist as he closes the gap to deliver the trapped opponents their Last Rites. Yorick’s true potential as a splitpushing demon emerges when he gains access to his ult, Eulogy of the Isles. Even without a decent-sized minion wave, Yorick and the Maiden can form a nigh-unstoppable army of Mist Walkers that’ll keep turrets occupied for ages while the Shepherd-Maiden duo pick apart the structure. Each Mist Walker can tank a tower shot, and the Maiden takes more than a few blasts of her own before giving up the ghost. Leave Yorick alone in lane for too long, and pretty soon you’ll have an army swarming your Nexus. 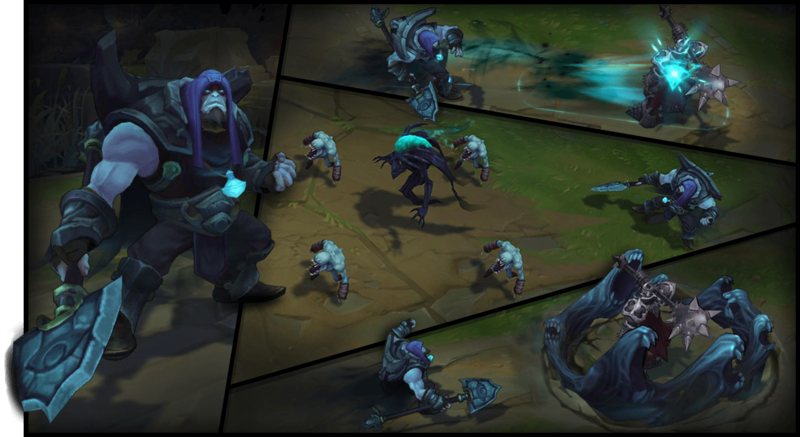 Yorick’s passive and ult give his team a unique way to press kill advantages in the midgame—with defeated opponents reborn as Mist Walkers, Yorick’s team will have a massive pile of friends to help quickly push down turrets. The Shepherd of Lost Souls just isn’t very good at engaging fights due to his slow, shuffling movespeed and complete lack of gap-closing ability. And if he doesn’t last-hit a few minions to prep some graves before the fight, he won’t be at full strength when the souls and spells start colliding. Once he’s in the fray, though, Yorick generally works like a juggernaut. He’ll want to build sustainability so he can survive teamfights long enough for his passive to kick in. With enemies falling all around him, he’ll have plenty of ghoul fuel to convert into more Mist Walkers. Yorick’s pretty good at peeling and zoning thanks to his W, Dark Procession. The writhing band of corpses is great for keeping enemy juggernauts from making it to the backline, or for zoning the other team’s carry out of the fight entirely. But it feels best when you use it to trap an enemy mage or ADC. Unless the victim can quickly escape by destroying the wall with autos, your team gets to play a rousing game of ring-around-the-squishies. The Maiden sticks around until her health is depleted, so if Yorick tanks for her, she’ll serve for long stretches as his own personal backline. Throughout teamfights, Yorick has to pay close attention to the Maiden of the Mist. If she’s hitting a target alone, she won’t deal much damage, but there’s a multiplier effect when the Shepherd and the Maiden focus someone together. She’ll stick around until her health gets depleted, so if Yorick tanks for her, she’ll serve for long stretches as his own personal backline—his basic attacks are melee, but hers are ranged. When both side lanes are unoccupied, the Shepherd has a chance to show off the most unusual ability in his kit: splitpushing two lanes at once. It works like this: the Maiden of the Mist is fairly intelligent by AI-companion standards, and she’ll continue to push a lane even if Yorick is no longer there. He can plop the Maiden into top lane, then TP down south to splitpush bot lane on his own. With adequate distance between the two, both are free to raise their own armies of Mist Walkers, up to four each, and push down two lanes at once (so long as the rest of your team can just hold mid for one minute). Of course, Yorick’s a lot weaker without his ghoulish sidekick, so split wisely. Yorick is not a popular champion. We’ll admit it! Out of the 131 champions in League, the bedraggled green guy has almost always been the least-played, least-loved champ on the list. But why? 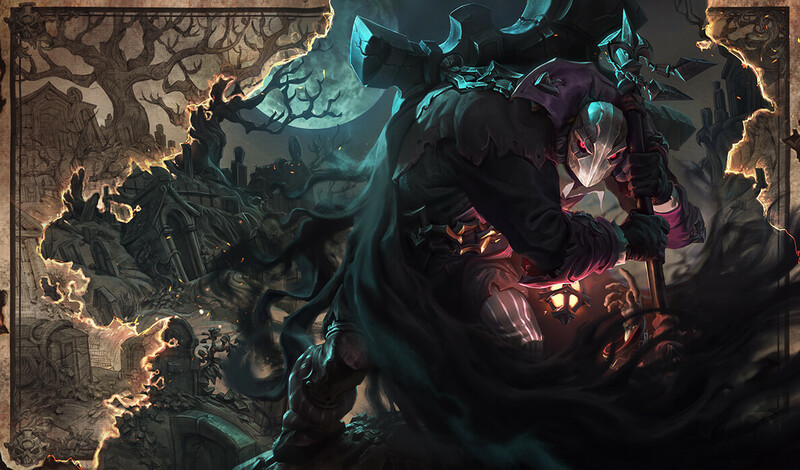 Sure, he’s a not-quite-meta, hard-to-balance champ, but we think the biggest reason for Yorick’s unpopularity is simple: Nobody wants to be a gravedigger. If you aren’t caught up on the latest Shadow Isles lore, here’s a quick summary: Long ago, the Ruined King travelled to a place then known as the Blessed Isles; He wanted to use the Isles’s eternal waters to bring his wife back to life. But the waters were never meant to reverse death, and when the King lowered her corpse into the magic waters, they became corrupted. The resulting Black Mist that emerged from the pool caused a magical cataclysm that morphed the Blessed Isles into the Shadow Isles—a place where the dead find no resting place. Yorick, a former monk on the Isles, is more-or-less a good guy, but he’s being slowly corrupted by the mist, which clings to his back in the form of a cape comprised of thousands of agonized souls. Think about it. What image popped into your mind when you read the word “gravedigger?” Probably some hunched-over, half-dead lunatic who’s always shuffling around in the rain, only ever stopping long enough to wave a crooked finger and holler at trespassing children. And that’s pretty much who Yorick was. He was the modern stereotype of a cemetery attendant (a perfectly respectable job that, if we’re being honest, few kids actually aspire to have when they grow up). But every culture, throughout time, has needed people to tend to the dead. And in some cultures, these custodians of the afterlife had to take great pride and go to extreme lengths to help lost souls get to the great beyond—or wherever it was they were supposed to go. In ancient China, for example, travelling Buddhist monks would often bring along a Moon Tooth Spade: a double-sided weapon with a shovel-like scoop on one end and a crescent-shaped blade on the other. The tool had multiple uses: If the monk happened upon a corpse on the road, he could properly bury it and deliver all the necessary Buddhist rites. And, if he encountered bandits or wild animals, he could bust out the crescent blade to beat the holy hell out of his attackers. It was here, in the story behind the Moon Tooth Spade, that we began to see our opportunity for Yorick. What if he was more like that older style of gravedigger—one who cares for the dead with one hand, but isn’t afraid to bring death with his other? Narrative writer John “JohnODyin” O’Bryan began to outline a new, way more heavy metal vision for Yorick’s backstory. “He isn’t just a gravedigger,” says JohnODyin. “He’s a custodian of life and death. Whenever someone is close to death, Yorick can decide to bring them back using a vial of holy water around his neck, or he can send them on their way to death.” He’s a twisted combination of Death himself and a guardian angel, bringing judgment from above. With his new backstory, we’d turned the Gravedigger into the Shepherd of Lost Souls. But then came the tough part: translating that into the game. 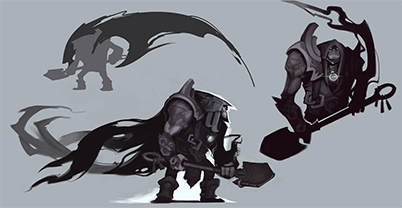 Despite longstanding issues with Yorick’s design, we felt we had a pretty clear idea of exactly how his kit and visual thematics needed to change. He needed to remain a necromancer, so we knew he’d be summoning some sort of wraiths or ghouls. The new story about the cape of souls on his back gave us the perfect explanation for his ability to bring forth Mist Walkers into the world—he just reaches into the mist and yanks out a handful of ghoulies. The Mist Walkers, once raised, aren’t necessarily the soul of any particular dead person, because when Yorick adds a soul to the soupy miasma of his cape, it works sort of like pouring a cup of water into a swimming pool. 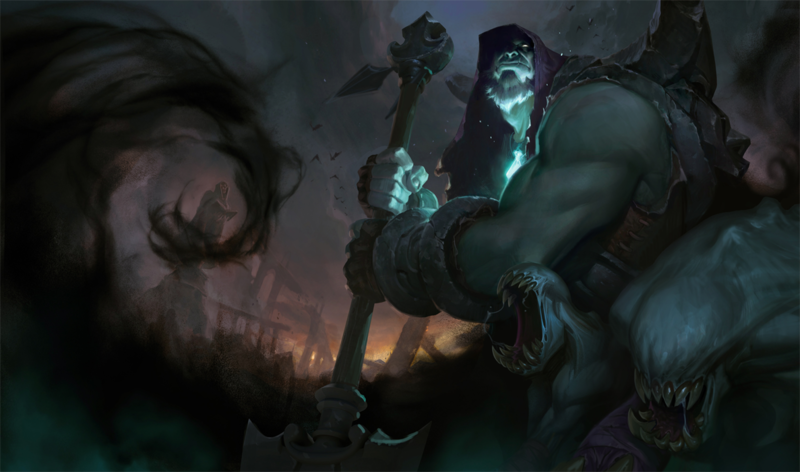 When Yorick performs Awakening in-game, he’s actually just filling the corpses of his enemies with a cupful of the black mist, scooped fresh from the ghoul jacuzzi on his back. The mist animates the body, creating a Mist Walker. When viewed from the back, the Shepherd’s rocky costume also makes him look a bit like a tombstone shuffling around on the Rift. This was intentional, partly because it fits so well with his persistent, deliberate gameplay pattern. When he sets his eyes on a goal, he gets tunnel vision—he wants to just push down a lane with his army. Slowly. Certainly. He’s ultimately a character that tests your ability to adapt to predictable AI actions,” says Solcrushed. “Mist Walkers are a pretty simple AI. It’s like you’re a shepherd leading sheep. The biggest game design challenge when building Yorick, says Solcrushed, was figuring out how the ghoul raising process works. At first, any minion who was given their Last Rites immediately turned into a Mist Walker. Yorick raised a walker, his enemy killed a walker, rinse, repeat. The system was pretty unsatisfying from everyone, because Yorick never gained a real army, and his enemy had a constant, obnoxious workload to deal with. At another point in the design process, the Shepherd’s ult gave him global ghoul raising. He’d blanket the whole map in darkness, turning everything that died during the cold night into a ghoul. The ghoul army would push every lane at once, and the reanimated corpses of freshly farmed monsters would come streaming out of the jungle. “It was pretty cool, but it was also batshit insane and totally unpredictable, so we cut it,” says Solcrushed. If you have any questions, feel free to ask me at @NoL_Chefo or e-mail me at [email protected]m.